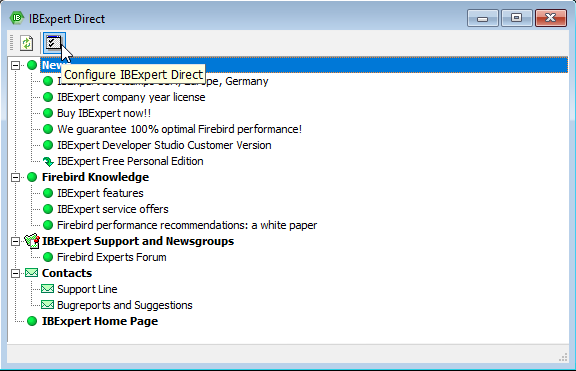 The IBExpert Help menu item IBExpert Direct... provides all users with news concerning IBExpert, such as new versions, software download areas, forums, and also contact links. By clicking on any of the links the relevant URL is opened in your standard Internet browser. IBExpert automatically checks for the newest version, and informs you if an update is available, If, after logging in to the IBExpert Download Center, you can no longer see a Customer version, this probably means that the subscription validity period for your software registration has expired. You can purchase the respective IBExpert 12 month software subscription for your software online. The Configure IBExpert Direct icon opens the IBExpert Options menu item, Environment Options / IBExpert Direct dialog, where it is possible to specify how often the network should be polled for new items, and to configure a proxy server if wished.